Every other day we would get questions about Search Engine Optimisation (SEO). What is it? Why is it important? Should we be doing it? Until now, we haven’t offered SEO services to our clients despite the clear need for it. Why? It’s simple. We haven’t been able to come up with an offering that we would use ourselves. That’s the test we put everything before we offer it to clients. If we use our own services and they stand up through all the punishment, then its good enough for our clients as well. We started SEO on our own site in September (two months ago). 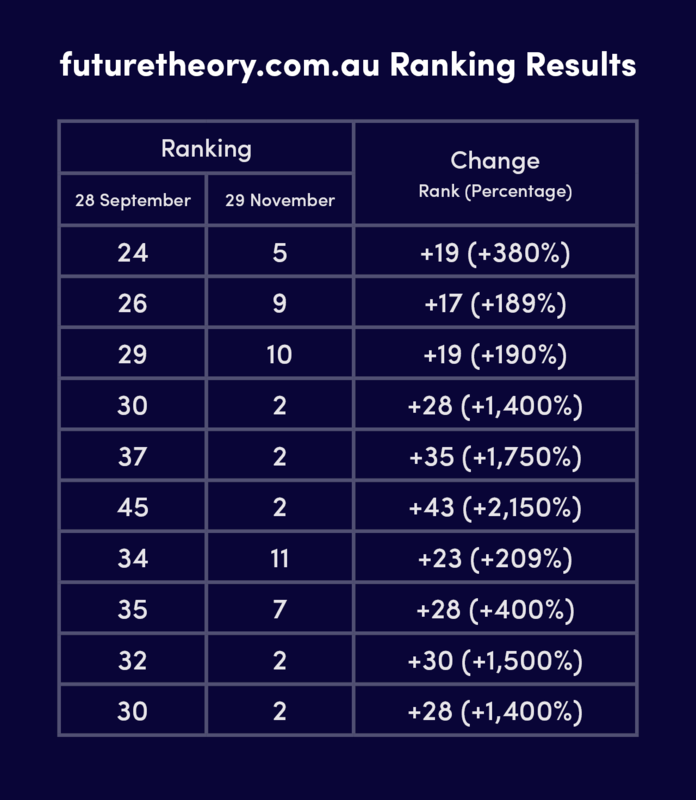 Since then we’ve been slowly watching our rankings rise for our targeted keywords and are proud to present the results below. Across the board, we have been able to achieve between 189% and 2,150% increase in rankings. This has taken our site from page 3-5 of search results to page 1 for most search terms. We haven’t disclosed what search terms we were going after, however, note that these search terms are searched thousands of times a month. If we can get even a fraction of this traffic, this builds our leads for new projects. Our industry is a relatively competitive one as well. We have competitors from all over Australia and the world. This makes the results we have achieved even more impressive (since the competition is so high). We are confident that the best is yet to come as we keep chasing the #1 spot in search. For our clients interested in SEO for their own site, we’ve got packages available here. These packages are designed so that you only pay for results. SEO is a great way of marketing but you need to have a website designed to convert visitors into clients. Contact us for a complimentary website review. This complementary review will give you insights on how to improve. Of course, we also design and develop websites, and offer packages for projects combining websites and SEO.